Installing a new (or new to you) x-ray machine? Moving an existing machine to a new office? The state requires a shielding analysis for most x-ray machines. Our qualified experts can conduct analysis of existing or new spaces and provide you with a shielding design if needed. Atom Physics can also do the build out. In a properly functioning x-ray machine, the radiation leakage from the tube is minimal. However, a vast majority of radiation dose to the staff comes from the patients, animals, or objects being radiated. For example, in medical uses, when the primary x-ray beam enters a patient’s body, some of it travels straight through and turns the image receptor black. 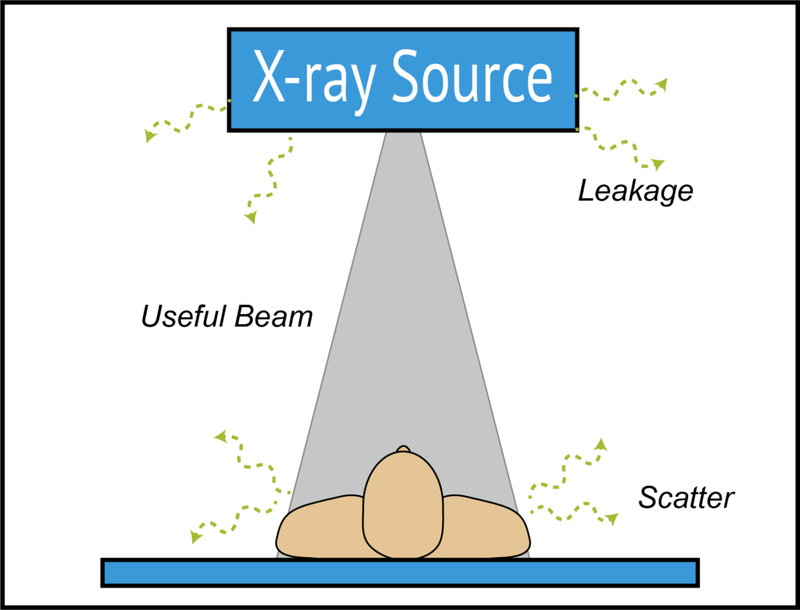 Some of the x-ray beam gets scattered by the hard bone and leaves the image receptor white, thus making an x-ray image. Staff in the x-ray room and in adjacent areas may be exposed to this scattered radiation. Proper shielding design for an x-ray room limits how far the scattered radiation will reach. All materials — even air — reduce radiation dose. Some materials are just more efficient at it. Shielding often takes the form of lead-lined walls or glass. For additional protection, staff may wear lead aprons when they are near to the patient or object being radiated. Lead is an efficient, cheap, and readily available shielding material. The shielding industry has built up infrastructure around lead so that most people now assume that lead shielding is required. However, lead is a heavy and hazardous material: costly to ship and dangerous and costly to remove. Atom Physics is happy to provide lighter, flexible, non-toxic alternatives that are the future of radiation shielding.